Four wheels good, two wheels bad. Unless two of the four wheels are in the air. Wheelies are awesome, and here are the ten best, as suggested by Jalopnik readers. What&apos;s the most awesome wheelie ever done? Why It's Awesome: This clip, from the World Power Wheelstanding Competition in Byron, IL circa 2006 shows a 1974 Gremlin doing entirely un-Gremlin-esque things. At one quick point in the clip, notice that the car isn't even wheelieing anymore- instead it has all four wheels off of the ground and is just sliding along on its rear bumper. The car belongs to Brian Ambrosini of Kenosha, WI, and it's known as the Big Bad Orange Gremmie. He estimates the car puts down about 1,250 horsepower. Wrap your head around that for a minute, and then move on. Why It's Awesome: At first, this bus looks like just your average hot rodded school bus. No big deal, it'll be loud and fast and everyone will be amazed because it's a school bus! But no- it's also a wheelie machine. And it shoots flames out of its roof! This thing just keeps getting better and better. Why It's Awesome: A trailer driving on its own is weird enough, but when the thing takes off across a grassy field with bicycles strapped to it and starts busting wheelies left and right, a whole new level of strange is reached. For a camper that isn't even supposed to have an engine, this thing sounds pretty powerful, and looks like a whole lot of fun. Why It's Awesome: The Hemi Under Glass cars are one of the most legendary families of wheelie machines in history. Driven by Bob Riggle and built by the Hurst company, these Plymouth Barracudas had their engines moved to the trunk and put under the big rear glass to make them more prone to front-wheel-takeoff. Mr. Riggle keeps the front of the car in the air for the entire run, shooting sparks out the back the whole way. In this clip, after a false start, the action gets going at around 1:45. Why It's Awesome: When I first saw this clip, I assumed the crazy Swedes at Scania were testing a new model of "visibility-enhanced" trucks that lift the cab going up hills so the driver can watch for trouble ahead. Turns out, this beast was just towing two trailers and literally lifted its front wheels off the ground from the stress. It's not fast, there's no smoke, sparks, or fire, and no one cares about its quarter mile time. It's just a big truck carrying a big load. Why It's Awesome: The kid is so short, he's gotta get dad to put a booster seat in his sandrail. Once they're in though, the little punk blasts across the dunes on two wheels at an estimated 55 miles per hour. This clip, shot at Glamis Dunes in California makes us incredibly jealous, and want a ride. Why It's Awesome: The personal life of its host aside, Monster Garage was a fun show. And the Satanbulance was pretty sweet. "Now I know why God put me on this earth" says Jesse, "All that metalwork and fabrication? That's all B.S. I was meant just to do wheelies." Why It's Awesome: The torque is strong with this one. These Quebecois sure look like they know how to have a good time. 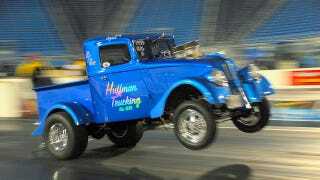 From the 2007 edition of the Rodéo du Camions (that's French Canadian for "tractor rodeo"), these massive hulking beasts have so much power they do sideways-wheelies at the start line, and then blast down the strip belching black smoke the whole way. Commenter BroncoMech notes that you could probably fit a Civic under the left truck's wheel, and we don't doubt it. Why It's Awesome: This guy gets props not just for his outstanding wheelie skills at the helm of a John Deere, but for the geodesic dome it looks like he keeps it in. Though it's surely not the most efficient way to mow, it is absolutely the most stylish, and could be helpful when trying to get really tall grass under control. Buckminster Fuller would be proud. Why It's Awesome: Two wheels bad, except when doing wheelies. Max Biaggi is the current World Superbike Champion and wheelie expert. I don't know how the hell he kept his bike from flipping over, but he managed to keep the shiny side up, and for that we applaud him heartily. Now someone get him a new race suit. This one's probably dirty.